It begins with a little church community that needed expanding in 2005. The church was in Minooka and Fr. Mark Fracaro was the pastor. This is our story. We were growing quickly and needed plans for our future! So with prayer and dedication, parishioners embarked on a mission to build a bigger church for St. Mary's. Thus was the beginning of the “Seeds of Faith” campaign. Plans drawn up, committees formed, and donations secured. Then the recession of 2008 hit. Church members lost jobs and/or moved away and many pledges went fulfilled. After a number of years passed, questions arose about the fact that our building project was in limbo. In the meantime, money collected from that pledge drive has been invested with the Diocese, earning interest. But the amount in the bank was not enough to develop the original site and construct a new church. We have reassessed our needs. There is good news! 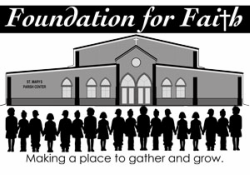 It is now possible to provide a gathering place that will benefit our family of faith for many, many years. And the primary focus will be our children and grandchildren. that 450 children are enrolled in St. Mary's Religious Education (RE)classes this year? that St. Mary's pays rent to the public school for the use of their classrooms? using public school space limits our RE staff and volunteers' ability to visit the church, incorporate prayer services, rituals and rites into their curriculum? The school has been generous and accommodating, but there is no guarantee that we will have this space available in the future. that some Religious Ed students do NOT know where St. Mary's church is located? Given that the world is producing a generation that knows a lot, but is greatly deficient in moral and spiritual values, our children and grandchildren can become a strong force for good in Minooka and the world as long as there is a strong Catholic foundation. Every youth educated in our Catholic faith represents the potential to bring many others to the Lord, which is exactly what we Catholics are called to do. Our new Parish Center will provide the environment to facilitate that potential. Our secondary focus for the Parish Center is to provide additional space for my staff as well as for the 20-25 Commissions and/or committees meeting regularly, doing the necessary work to keep our parish vibrant, running and centered on the Lord. We will finally have a dedicated gathering place for all parishioners to celebrate life and our faith. As the Pastor of St. Mary's, this support helps me to grow our community as a Christ-centered family! The “Seeds of Faith” campaign will now transition into “Foundation for Faith” campaign, to become the vehicle for allowing us to unify and organize for our next challenge. Nearly all donors to the prior campaign gave their permission to change focus from a new church to the new Parish Center. The amount of money we have on hand goes a long way to cover the cost of building a new structure. As I mentioned before, the Parish Center cannot be completed without your financial support. This Center is not just a “want”, it is a “need”. Because faith and action go together, I am enclosing a Commitment Card for you to prayerfully consider making a generous donation and return it in the collection basket or to the parish office. To those who contributed to the “Seeds of Faith” campaign, I wish to express my sincerest gratitude for your generosity. You have played a major role in getting us to this point. My prayer and hope is that all parishioners will respond generously. If you love your faith and church, please give; I cannot do this without your help. For me, just saying “Thank you” seems so inadequate for all you have done to support our parish family so generously in all areas. I know I can count on you for this too. I am so blessed to be your Pastor.